Signal routing and management box for large, integrated PXI based system utilizing National Instruments (NI) test platform. 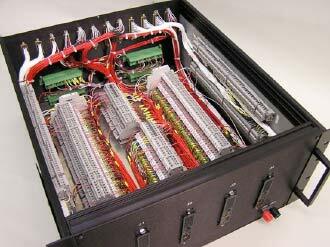 Modular Product Interface Box (PIBx) provides effective signal routing and management, while also enabling highly maintainable and upgradable system design. This unit is mounted on slide-out rails which allow the engineer or technician easy access for troubleshooting and maintenance.